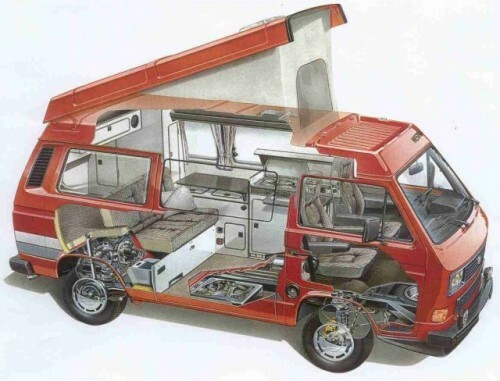 The Vanagon was a step up from the T2 in the amenities area with standard features such as power steering, air conditioning, power door locks, electronic/heated mirrors, lighted vanity and more. The Vanagon was available with both a four and five speed manual as well as a 3-spd automatic transmission. The automatic had a 1.0 ratio top gear and was a standard hydraulic used by many Audis of the same area. The 4 speed manual was fitted with a lightweight aluminum alloy case and was initially the other manual option. In 1983 the five speed manual was offered for certain models and came stock on diesel engine and Syncro 4X4 Vanagons. Original air cooled engines came with both quality issues as well as manufacturing costs problems. Later on in the Vanagon generation water cooled versions were introduced. Because the motor was mounted near the transaxle very low in the back certain accommodations were made to reach basic engine components. This included placing the oil filler tube, dipstick and powering steering fluid reservoir located behind flip-down license plate door for easy access. The spare tire was also relocated to the front of the vehicle in approximately the same relation to the front axle as the motor is to the rear. Listed below are the various engines used throughout the Vanagon production. 1.6 L (1,588 cc) (52 bhp) (Serial # CS) Naturally aspirated Diesel I4, available in the US on 1982 models only. 1.7 L (1,715 cc) (54 bhp) (Serial # KY) Natural aspirated I4.